When a suspicious gypsy and his girlfriend park their van in the midst of Lochdubh, it's not long before the crime rate begins to soar. Although none of the villagers wants to give him any information, Police Constable Hamish Macbeth must solve a case that is truly bizarre. 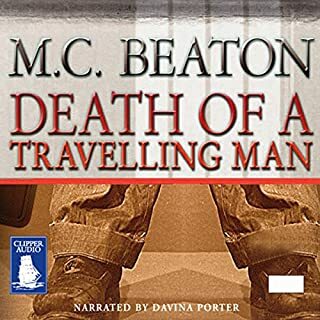 Would you consider the audio edition of Death of a Traveling Man to be better than the print version? What was one of the most memorable moments of Death of a Traveling Man? 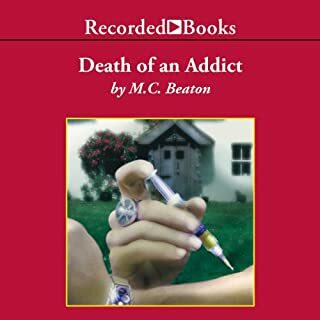 IWhat first comes to mind when recalling the book is when Hamish McBeth discovers the clue that leads him to the killer. It is suprising, but does not directly point to who the culprit is. That is the interesting thing about these books; the clues mount and create uncertainty as to who is ultimately guilty of the crime. Davina Porter presents the characters with personality that is consistent and believable. I have a difficult time tearing myself away from these books. My housework is suffering. I love the whole series. It is my escape to Scotland. Life is finally looking up for the poor relations. The Prince of Wales’ coat of arms gleams over the hotel entrance. All but one of the rooms are filled by the open-handed Prince Hugo and his entourage. They have finally reached a position comfortable enough to allow them to consider offers to buy the hotel. The poor relations’ hard-earned success, however, is in stark contrast to the plight of their latest guest, Lady Jane Fremney. 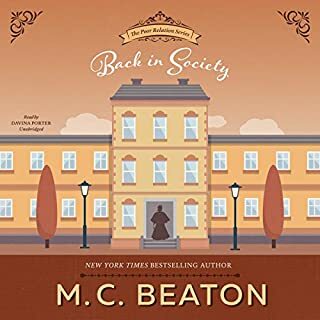 The slight, beautiful youngest daughter of the Earl of Durby has been cast out of her family for refusing to marry the man her father has chosen.